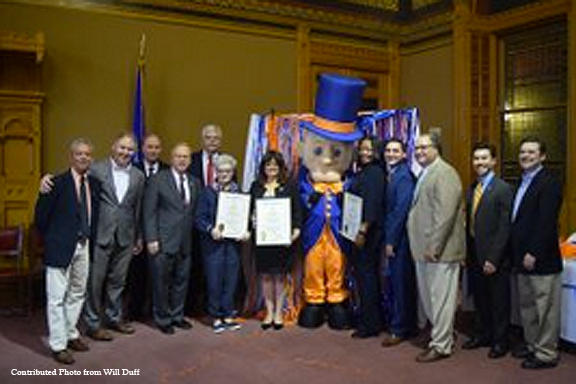 Hartford – Danbury legislators gathered at the Capitol April 12, to honor two local couples for their contributions to the Danbury community. Citations from the Connecticut General Assembly were presented to the couples during the annual Danbury Day celebration. Bob and Lynn Taborsak and Bob and Judge Dianne Yamin were thanked for their considerable civic and charitable work by State Senator Michael McLachlan (R-24) and State Representatives David Arconti (D-109), Will Duff (R-2), Michael Ferguson (R-138), Bob Godfrey (D-110), Stephen Harding (R-107), and Richard Smith (R-108). Rep. Godfrey said Bob and Lynn Taborsak have both served as members of the Danbury City Council. Lynn Taborsak was a state representative when Rep. Godfrey was first elected to represent the city in Hartford, and previously served as the President of the Connecticut National Organization of Women. Bob Taborsak is a former educator and well-known high school track coach who also served on the Danbury Board of Education. Sen. McLachlan said Bob and Judge Dianne Yamin are active members of the Danbury Lion’s Club and St. Anthony Maronite Church, among other civic and charitable organizations. Judge Yamin has served as a Judge of Probate since 1990 and is a past President-Judge of Connecticut Probate Assembly. Bob Yamin is Corporation Counsel and Chief Legal Officer of the City of Danbury and a member of the Danbury Lebanon American Club. In addition to honoring exceptional citizens, Sen. McLachlan said Danbury Day gives legislators a chance to shine a light on the community named Connecticut’s Most Livable City by 24/7 Wall Street. 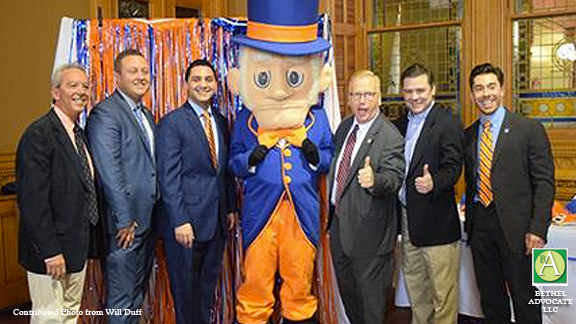 As the youngest member of the Danbury delegation, Rep. Ferguson worked with the city and school district to organize the annual event. In addition to featuring fair food, it honored the Yamins and the Taborsaks for being outstanding community members. Three Danbury school principals who lead schools recently named as “Schools of Distinction” by the State Department of Education were also honored.